The Two Ewes are both in Seattle! Assembling spinning wheels, meeting listeners, weaving, and knitting are just some of the activities from their fun week. 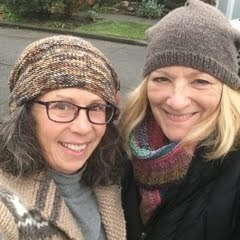 Marsha is knitting a new project since the last episode. The pattern is Opteka by Isabell Kraemer and the yarn is Imperial Yarn Tracie Too. 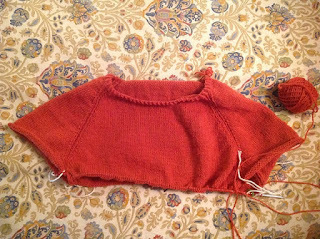 This is Marsha's second long-sleeved pullover. She is wearing her Combo Spin sweater so much she decided to make another sweater with similar characteristics. Marsha has also finished a project already this year. In fact, it was finished in two days! 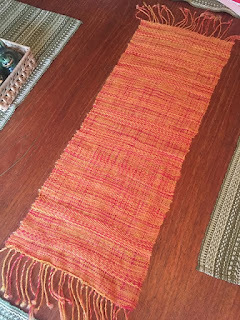 Her first weaving project was a huge success. There will be more information about this in the next Winter Weave Along episode. Kelly is almost exclusively working on the Indigo Frost by Isabell Kraemer. The Ewes are definitely enjoying her patterns these days! Kelly's version is a vivid spring green cormo yarn from Sincere Sheep in the Virid colorway. The color work portion is being done with handspun left over from her Funky Grandpa cardigan. This will guarantee that she will stand out in a crowd! She also has weaving as her first finished project of 2018. 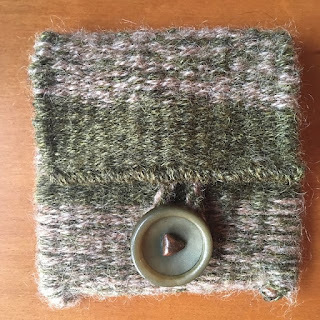 The woven pouch is finished, sporting one of her favorite buttons from the button stash. The directions for the woven pouch can be found in the first Winter Weave Along lesson. Marsha's new/old Ashford Traditional got a good spin at the Spin-In. 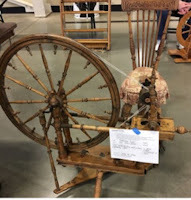 Many interesting wheels were there, including an interesting Dutch Moswalt wheel and an antique Norwegian Wheel with matching spinning chair that was for sale. The Ewes also made fiber purchases from a variety of fun vendors. Huckleberry Knits, Fleebers Farm, Sauked In Farm, and Homestead Hobbyist all got added to the stash. Kelly was delighted to find that a new mill with spinning capability has opened in California. Valley Oak Wool and Fiber Mill in Yolo County is now the only mill in the state that spins yarn. This article details the story of the mill's owner and its recent opening. Stay tuned for more about this exciting development! Marsha shares a video in which Fairy Little knits a sweater in one day using time lapse video. Amazing! We're more than a yarn shop! Subscribe to our podcast and join in our Ravelry group!